Dr. Danyluk began at Tech in 1993 as a Professor and Morris M. Bryan, Jr. Chair in Mechanical Engineering for Advanced Manufacturing Systems. Prior, he was an Associate Professor and Professor at the University of Illinois at Chicago and founder and director of the Manufacturing Research Center. In 1995, he became the Director of the Manufacturing Research Center at Georgia Tech. Dr. Danyluk’s research has involved the measurement of the mechanical properties of semiconductors and the development of methods to measure the damage in these materials when they are processed. For example, he has been interested in wafering, lapping, grinding, dicing, and polishing of silicon and gallium arsenide. These processing methods involve deformation by diamond-impregnated tools flooded with lubricants, which is the domain of tribology. Dr. Danyluk has used electron and optical microscopy to examine the damage caused by this processing, and has developed electrical methods to probe this damage that is not visible by microscopy. In the course of this research, Dr. Danyluk has ongoing research in the measurement of residual stresses by optical methods, and the development of sensors to probe the chemistry of surfaces. His research interests include the mechanisms of polishing, as applied to silicon, and the development of noncontact methods to measure surface chemistry. His career has been devoted to the study of interfaces and the mechanical consequences of the contact of these interfaces. Dr. Danyluk is currently funded by the Office of Naval Research, the National Science Foundation, and a number of industrial companies. Non-Vibrating Capacitance Probe for Wear Monitoring, U.S. Patent RE39,803, with A. Zharin, E. Zanoria, L. Reid, and K. Hamall, 2007. Contact Potential Difference Sensor to Monitor Oil Properties, U.S. Patent No. 7,019,654, with A. Zharin, 2006. Ionization CPD Gyroscope, U.S. Patent No. 6,679,117, January 20, 2004. Contact Potential Difference Ionization Detector, U.S. Patent 6,717,413B1, with A. Zharin, 2004. Non-Vibrating Capacitance Probe for Wear Monitoring, U.S. Patent 5,974,869, with A. Zharin, E. Zanoria, L. Reid, and K. Hamall, 1999. 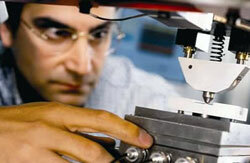 Near Net Shape Processing of Continuous Lengths of Superconducting Wire,. U.S. Patent 5,661,113 with M. McNallan, M. Lanagan, and R. Poeppel, 1997. X. Xing, et al. 2007. Simulation of Droplet Formation and Coalescence Using Lattice Boltzmann Based Single Phase Model. Journal of Colloid and Interface Science 311 (2), 609-618. Shijiang He, Steven Danyluk, I. Tarasov, and Sergei Ostapenko. 2006. Residual Stresses in Polycrystalline Silicon Sheet and Their Relation to Electron-hole Lifetime. Applied Physics Letters 89(11), 111,909 . Sum Huan Ng, et al. 2004. Wafer Bending Measurements in Chemical Mechanical Polishing. Journal of the Electrochemical Society 151(12), G819-823. H. A. Razavi, T. R. Kurfess, and S. Danyluk. 2003. Force Control Grinding of Gamma Titanium Aluminide. International Journal of Machine Tools and Manufacture 43, 185-191. C. S. Korach, J. Streator, and S. Danyluk. 2001. Measurement of Perfluoropolyether Lubricant Thickness on a Magnetic Disk Surface. Applied Physics Letters 79(5).